Gordon Shedden, Jason Plato and Mat Jackson shared the wins in yesterday’s (Sunday) three action-packed Dunlop MSA British Touring Car Championship races at a damp Oulton Park circuit in Cheshire. But it is Matt Neal who continues to lead the title race which now heads to the daunting Croft circuit in North Yorkshire on Sunday 19 – that’s despite a highly controversial last corner, last lap clash with team-mate Shedden in Oulton’s second race that put them both off the track as they fought for the victory. Scottish ace Shedden had achieved his second straight pole position in Saturday’s qualifying session and, on a damp track, duly took victory in the first of yesterday’s races ahead of the Silverline Chevrolet Cruzes of Jason Plato and his young Cumbrian team-mate Alex MacDowall. In race two Shedden was on course for another win but at the final bend the chasing Neal attempted to pass him. To the disbelief of the huge trackside crowd and live ITV4 audience their Honda Racing Team Civics dramatically made contact and together slithered off into the gravel trap. This gifted Oxford’s Plato victory ahead of Robert Collard’s WSR BMW and Newport Pagnell driver James Nash’s 888 Racing with Collins Contractors Vauxhall Vectra – although their positions were later reversed by officials who decided Hampshireman Collard had been overly robust in overtaking Nash. In race three, Jackson led every lap from the reversed grid pole to win in his Airwaves Racing Ford Focus. Shedden followed in second ahead of Staffordshire youngster Andrew Jordan’s Pirtek Racing Vauxhall Vectra. Neal leaves Oulton still ahead in the standings but by the much reduced margin of two points from Shedden with Jackson just another five adrift. Indeed, a mere 15 points – equivalent to a race win – cover the first six in the championship. Croft Circuit is now into final preparations ahead of staging the North East’s biggest motor racing event of 2011 – the Dunlop MSA British Touring Car Championship on Father’s Day weekend 18-19 June. Huge numbers of people are anticipated at the event for it is the only time this year that the BTCC, the pinnacle of car racing in the UK and indeed one of the most popular motor racing championships in the world, will visit the region. Last month it was the turn of Britain’s top attraction on two wheels, the British Superbike Championship, to wow the crowds at Croft. But now the clock is counting down the final 12 days before the country’s most spectacular four-wheel race series arrives at the North East’s number one motor sport venue just outside Darlington. Furthermore, Croft has extended the deadline to purchase tickets at special advance rates – from just £24 per adult on race day – until midday this coming Wednesday 8 June. Public wishing to book, particularly those looking for the perfect Father’s Day gift, can do so by visiting the www.croftcircuit.co.uk website or calling the main office 01325 721815. Adding to the event’s appeal, admission for children aged 15 and under is FREE. Camping is also available for those looking to make a real weekend of it. Once through the gate on BTCC weekend, the public will have open access to the race teams’ paddock and also the specially organised Pit Lane Walkabout session which gives them plenty of opportunities to meet the star drivers for autographs, photos and team give-aways. Now just 15 points – equivalent to a single win – cover the top six in the standings. Among those chasing Neal and Shedden hardest is Chevrolet’s Jason Plato, very much a ‘fans favourite’ at Croft thanks to his Newcastle roots, and his young Carlisle team-mate Alex MacDowall for whom Croft is also a home venue. Also in action on BTCC weekend at Croft (18-19 June) will be a further nine races for categories run by thriving Leeds-based UK sportscar manufacturer Ginetta with its Junior and GT Supercup championships plus Renault's Formula Renault single-seater and Clio Cup saloon car series. The same Formula Renault championship has in recent years produced Formula 1 stars such as Kimi Raikkonen, Lewis Hamilton, Heikki Kovalainen and Paul di Resta and fans at Croft could just be seeing another young hotshot making his or her way to the top – among those on the grid notably is Josh Hill, son of 1996 F1 World Champion Damon Hill while contesting the Clio Cup is Lewis Hamilton's younger brother Nicolas in his debut season of racing. The Croft paddock will start to take shape from the Wednesday onwards with the first track action on the Friday (17 June) when practice sessions for the Ginetta and Renault categories are held. 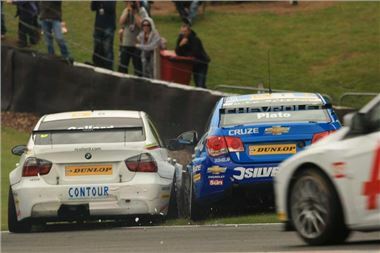 On the Saturday (18 June), the BTCC drivers will be first on track with their opening practice session at 09.30am. Sunday's (19 June) activities start at 10.00am with the driver autograph session prior to the day's first BTCC race at midday. For more information about Croft Circuit, its 2011 race calendar, details on ticket prices/how to book and the chance to drive the track in a variety of supercars (including a Ferrari 458) visit www.croftcircuit.co.uk website or call the circuit office on 01325 721815.